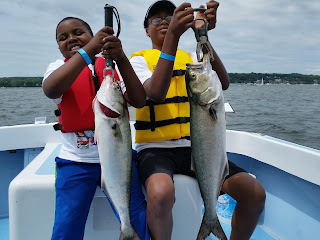 RJ and Quincy with giant bluefish to 11 pounds they caught in Greenwich Bay when fishing in Take-a-Kid Fishing sponsored by the RI Saltwater Anglers. Capt. Dave Monti and Jim Stevens of Warwick with a plump 31 inch bass Jim caught while fishing off Popasquash Point, Bristol after Take-a-Kid fishing. Carole Prisco of Warwick with the fluke she landed at Warwick Light last week. The Bonito has been chosen as the featured fish in this year’s “art Drive” in the Westport and Dartmouth area August 8 and 9. 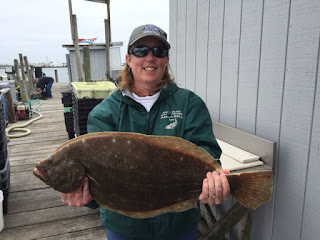 Here’s your chance to learn how to fish for summer flounder from a panel of fluke experts Monday, June 29, 7:00 p.m. at the Rhode Island Saltwater Anglers Associations’ (RISAA) meeting at the West Valley Inn, West Warwick, RI. 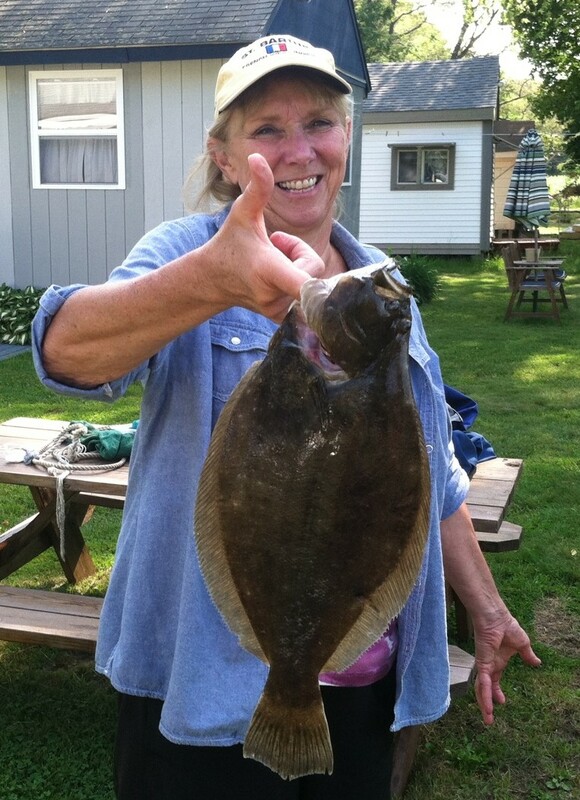 Gisele Golembeski, Susan Lema and Diane Valerien, some of the best fluke fishers in the northeast, will share basic fluke fishing techniques, advanced tips on tackle, bait, and tactics for finding and catching fluke. Dinner served by the West Valley Inn starting at 5:30 p.m. (not included in admission). Non-members welcome but are requested to make a $10 donation to the RISAA Scholarship Fund, RISAA members attend free. Visit www.risaa.org for details. “This is the first fish I ever caught.”, “I’ve never been on a boat before.”, “I caught four fish so far.”, “Thanks for taking us fishing.” These were some to the comments that 150 children between the ages of seven and thirteen had to say about the annual Take-a-Kid (TAK) fishing day Saturday sponsored by the Rhode Island Saltwater Anglers Association (RISAA). The aim of the program is to give children a chance to learn about Narragansett Bay and the environment, experience the thrill of catching a fish and ride on a boat in saltwater. And, they did. Senator Sheldon Whitehouse and four staff members volunteered their time to serve as mates aboard vessels or cook and serve hotdogs and hamburgers along with the 200 other volunteers that donated their time to make the day a success. Brewer Greenwich Bay Marina in Warwick once again donated their facilities to host the event. This was the 18th annual TAK fishing day. The Atlantic bonito will be featured in “the Art Drive” August 8 and 9 in the towns of Dartmouth and Westport, MA. Each year participating artists apply their creativity and style to create large, colorful depictions of popular species of fish. 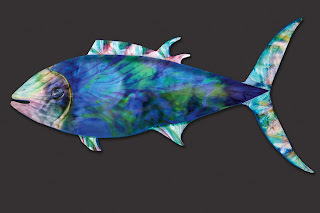 This year, the artists have chosen the bonito. Their four-foot long “Bodacious Bonitos” will be previewed in public spaces and in front of local shops, businesses and other sites in Dartmouth and Westport prior to the ART Drive weekend. The general public will be able to view and bid on the fish on eBay by going to www.the-artdrive.com. The ART Drive artists will individually donate a percentage of their sales to the Lloyd Center for the Environment, a non-profit organization that provides educational programs on aquatic environments and supports scenic, public walking trails through 82 acres of estuaries and salt marshes in South Dartmouth, Mass. For more information on the ART Drive artists, sponsors, demonstration times and a map of the “the Art Drive” route, visit: www.the-art-drive.com. The bluefish bite is very strong with anglers landing fish in bays and covers and along the coastal shore. Greenwich Bay was teaming with bluefish Saturday as 150 children and 65 volunteer boats successfully fished the area during the annual Take-a-Kid Fishing event. A young man named Quincy from the Davey Lopes Recreation Center, Providence fishing on my boat during TAK landed an eleven pound bluefish. John Migliori of Aquidneck Island said he has been landing large bluefish (8 plus pounds) from shore in the Aquidneck Island area. 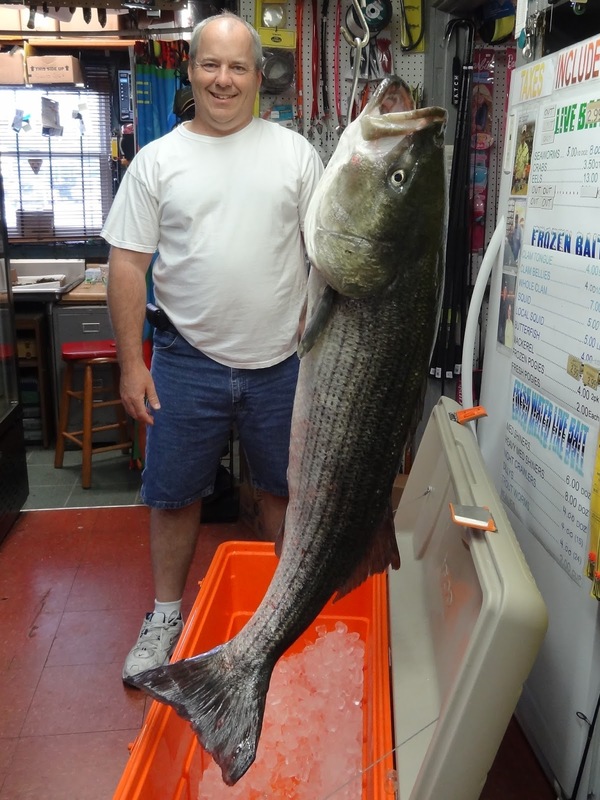 Dan Thivierge of Warren, RI weighs in a 43.6 pound, 50” striped bass at Lucky Bait & Tackle, Warren. Dan caught the fish Friday night off Colt State Park, Bristol using live Atlantic menhaden as bait. Pete Jones of Wellesley, MA with the 23” fluke he caught Friday, south of the Jamestown Bridge in 40 feet of water with a yellow buck tail tipped with squid. Capt. 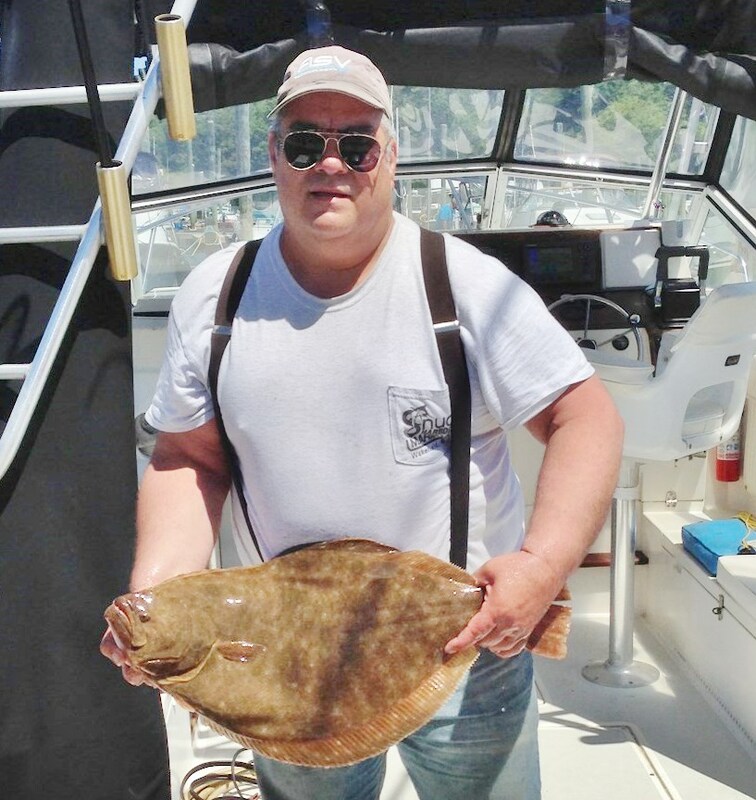 Matt Cox of the Frances Fleet with the 32 inch, 13.8 pound summer flounder (fluke) that fell victim to a customer’s small whole squid on a Pro series mylar green bait rig last week. 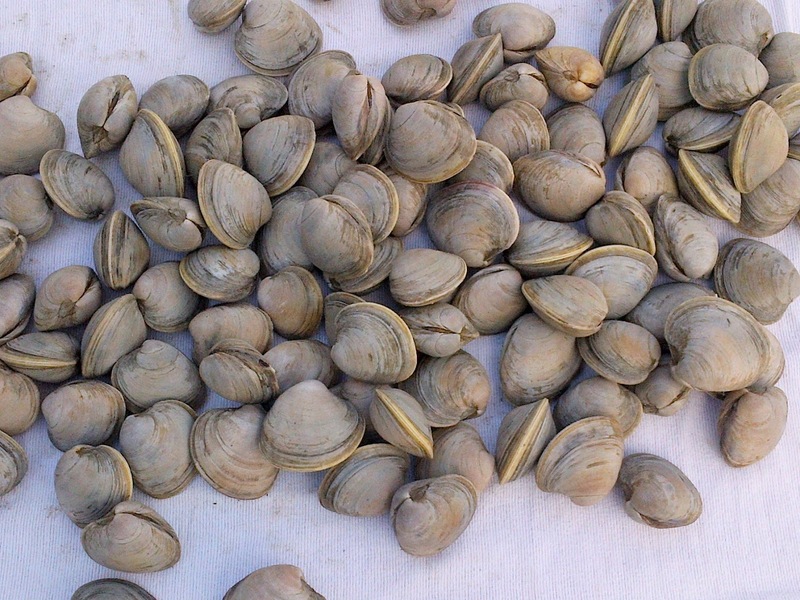 Learn how to catch quahogs this summer. Here is your chance to learn how to dig for clams and what type of equipment is needed. The program is sponsored by the University of Rhode Island's Sea Grant and features commercial shell fisherman Jody King, who will introduce participants to recreational clamming. Space is limited and registration is required. There is no fee for the class and registration is required. To register or for more information contact Kimberly Sullivan at kimberly.sullivan@dem.ri.gov or 401-539-0019. Alex Petti of fin & Feather Outfitters said, “We are holding a fly casting demonstration with instructions for both beginners and advance fly fishers on Saturday, June 20 at 10:00 a.m.” Learn about the Hexigina Hatch from fly expert Bob Greco and then take a casting lesson from local fly experts Ed Lombardo and Max Petti. Lessons are free. Both fresh and saltwater anglers welcome… learn about fly lines, leaders, knots and much more. Visit Fin & Feather Outfitters at 3520 Quaker Lane, North Kingstown, RI. Call 401.316.6924 or visit www.finandfeather@outlook.com for information. The Narragansett Chapter of Trout Unlimited (TU225) will host its regular monthly membership meeting on Wednesday, June 24, 2015, 6:30 PM. This meeting will be held at the RIDEM Deer Check Station in the Arcadia Management Area in Exeter, RI. Directions for driving to the Check Station can be derived at this Website (http://narragansett.tu.org/narragansett/chapter-meetings ) by clicking on the link to the map and inserting your starting point. A panel of experienced fly anglers will discuss the process and successful practices for fishing the “Hex” hatch on the Wood River. Questions will be answered and sample Hex flies will be available for inspection. A variety of fly tying materials will be available. Fish before or after the meeting. Contact Ron Marafioti at (401) 463-6162 for information. On Saturday, June 27 from 9:00 a.m. to 3:00 p.m. the Narragansett Chapter of Trout Unlimited (TU225), the Wood River Fly Fishing Club, the United Fly Tiers of RI, and RIDEM's Aquatic Resource Education program will sponsor their first-ever Women-Only Fly Fishing Workshop. Fly fishing instructions by experienced fly anglers from all over the state will be provided to help teach women how to tie flies and fly fish in a hands-on, safe, and non-competitive environment. This program will focus on equipment needs, fly tying, fly casting and fishing areas across Rhode Island. Lunch will be provided. Space is limited and registration is required. For more information and to register, please call 401-539-0019 or email at kimberly.sullivan@dem.ri.gov. Jay Ancgil of Coventry with bass to 17 pounds he and friend Mike Swain caught in the East Passage this week live lining pogies (Atlantic menhaden). 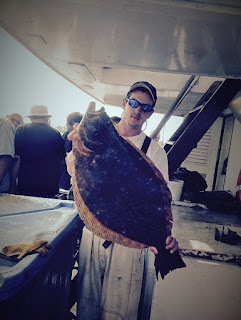 Frank Travis of North Kingstown with the 24” fluke he caught west of New Harbor, Block Island this week. Mike Wade (owner of Watch Hill Outfitters, Westerly) weighs in Braeden Giller’s 7 pound, 8 once summer flounder (fluke) he caught off Misquamicut State Beach this week. Atlantic menhaden or pogies as they are locally refereed to are a great bait fish for striped bass. This week many of them were eaten by striped bass as anglers throughout the region used this great forage fish as bait. Atlantic menhaden are also roving filter feeders, converting algae into energy and thus reducing nutrient loads in bays and covers. An adult menhaden, through its unique filtering gills, is able to process up to 4 gallons of water per minute or a million gallons of water every 180 days. Multiply this by the number of menhaden in any given area and this is an amazing amount of water being filtered, a reduction of nutrients means fewer algae blooms and ultimately more oxygen for all fish. Most (80%) of the anglers reporting they hooked up with a striped bass in the past three weeks said they were using Atlantic menhaden as bait. To catch live menhaden to use as bait, anglers cast a net for them or snag them with a weighted treble hook. They are generally brought back to the boat and a hook is put through the bridge of the nose or back and then the fish is put back into a school of live menhaden. You can also use dead menhaden as bait (bought at a bait shop) fresh or frozen. Some prefer to fish the menhaden whole others cut it in half, yet others chunk it up and use large pieces. How anglers use dead menhaden as bait largely relies on what the striped bass want. Some days/seasons they want it chunked, other times they want it whole and sometimes they won’t bite anything but live menhaden. 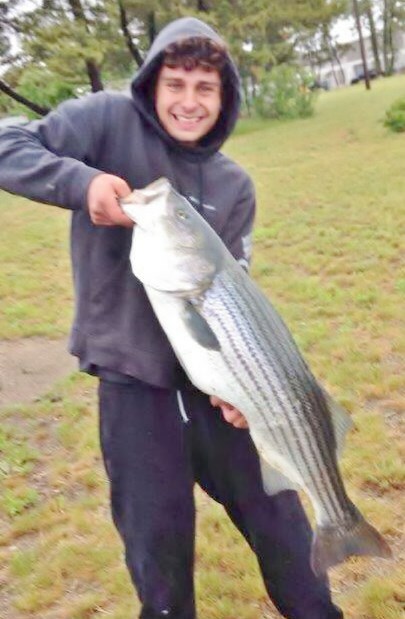 Some anglers use a weight slide to get the bait down to the striped bass. 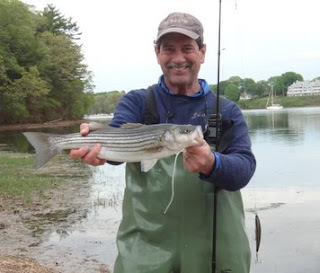 Another method working to catch striped bass this spring is trolling with umbrella rigs (mimics a small school of bait fish) or trolling with tube & worm. However, the larger fish in bays, coves and rivers caught so far this season have been landed using live Atlantic menhaden as bait. Atlantic menhaden (pogies) commonly used for striped bass bait have been spotted in large numbers in Narragansett Bay, Mt. Hope Bay and in south county area in rivers, coves, salt ponds and sanctuaries. Scup are just making their presence known with reports of anglers starting to land scup in several areas , not in large numbers yet but few anglers are targeting them at this time. “Fresh water trout fishing has slowed; hopes are that DEM restocking will reinvigorate things later this spring. However, the pickerel bite was very strong this week at the Kickemuit Reservoir and some nice carp have been caught in the Blackstone River.” said Manny Macedo of Lucky Bait. “The bass bite has been good at Echo Lake, Barrington along with a decent catfish bite.” said John Littlefield of Archie’s Bait. 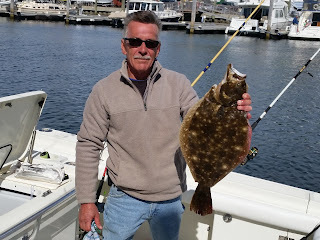 Mike Swain of Coventry landed fluke to 5.5 pounds off Jamestown and Newport this Saturday. 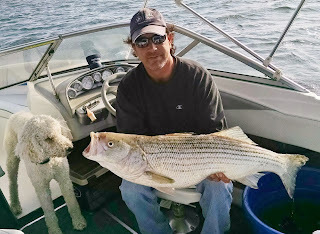 Scott Kiefer and his dog landed this 36” striped bass off Prudence Island last week using a Sebile Koolie Minnow. Capt. 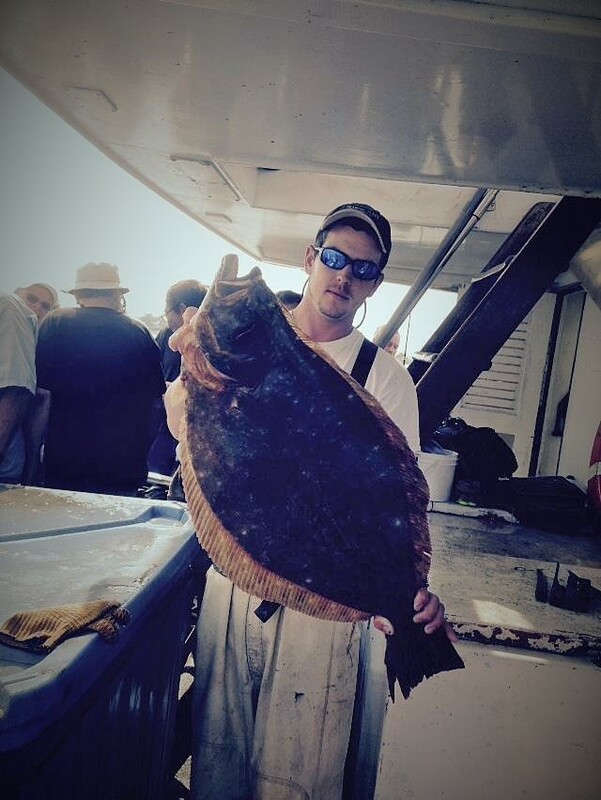 Roland Guyette of Offshore Charters landed this summer flounder (fluke) in 53 feet of water off the center wall of the Harbor of Refuge. Vinnie Catauro of East Greenwich landed eleven bass to 36” while fishing in Narragansett Bay last week. Brandon Hagopian of Cranston landed this 30 pound striped bass from shore in Providence Monday using 12 pound test line and light tackle. Rhode Island has played a huge role in the development of saltwater fly fishing. Our miles of coastline are perfectly suited to cast a fly and an abundance of sport fish such as striped bass and bluefish in the spring and bonito and false albacore in the fall made us the perfect place for saltwater fly fishing to flourish. Rhode Island’s fly fishing clubs such as the Rhody Fly Rodders (the oldest saltwater fly fishing club in America) and its members have paved the way nationally for saltwater fly fishing. This year, the Orvis Company recognized that Rhode Island is the perfect place to saltwater fly fish and is holding their highly acclaimed Orvis Saltwater Fly Fishing School at The Saltwater Edge, 1037 Aquidneck Avenue, Middletown, RI. The two day school is being held on four weekends in the spring and two weekends in the fall. Anglers will learn how to tie essential knots, how to choose gear and tackle, proper fly selection, how to read water, currents and ties, and how to play, land and release fish safely. For information call the Saltwater Edge at 401.842.0062 or visit www.orvis.com to learn more about the two day course. The Rhode Island Marine Fisheries Council (RIMFC), which makes commercial and recreational saltwater fishing regulation recommendations, met Monday to address primarily commercial fishing issues. Highlights include establishing a fall opening of the Narragansett Bay Maine Life Management Area to Atlantic menhaden purse seine commercial vessels after September 1 each year in areas south of the Jamestown and Newport Bridges as well as the area south of the line from Fogland Point to Sandy Point in the Sakonnet River. The conditional opening would occur only if the states quota has not been exhausted or if the Episodic Event Set Aside Program has been enacted in RI. A possession limit of 25,000 pound will be allowed in the area. Regulations for commercial fishermen using cast nets or rod and reel to catch Atlantic menhaden were liberalized as well. The council voted to recommend to the DEM director that commercial fishers should be allowed to fish on weekends and holidays for Atlantic menhaden supplying fishermen with bait on the weekends. In other important business the RIMFC unanimously elected Councilman Christopher Rein (an environmental engineer) to the position of chairman of the Industry Advisory Committee (IAC). This year the IAC is scheduled to make important commercial fishing regulation recommendations reviewing, revising and updating many of the older fishing regulations in Rhode Island. The council also heard alarming concerns for commercial fishermen about the rigid black sea bass, tautog and summer flounder regulations now in place in Rhode Island and all along the coast. Fishermen said they were being driven out of business and asked that the RIMFC formulate a plan to address their concerns regionally where regulations are made. RIMFC chairman Robert Ballou suggested that the issue be placed the agenda of the next meeting so DEM staff can relate stock status, regional fishing management plans, etc. for these species as well as hear concerns and recommendations that fishermen may have. Tuesday night the U.S. House of Representatives approved, by a 225-152 vote, H.R. 1335, a revision and reauthorization of the Magnuson-Stevens Fisheries Conservation and Management Act (MSA). The MSA is the primary federal law governing U.S. fisheries management. A version of the bill will now be taken up with the U.S. Senate. Vandermark said, “We hope the Senate will follow in the tradition of Senators Magnuson and Stevens and work across the aisle to draft a bill that builds upon the law’s success and strengthens it to meet the new challenges our oceans and fisheries face. We look forward to working with the Senate to renew the Magnuson-Stevens Act for the benefit of fishermen, seafood business owners, coastal communities, and all Americans who rely on healthy oceans and productive fisheries." Several key provisions of the bill include a provision that reforms the current 10 year stock rebuilding timeline to allow for more flexibility, as well as language that aims to make the management process more transparent by requiring the live broadcast of fishery management council meetings as well as making other materials publicly available. The bill also included an amendment authored by Massachusetts Congressmen Keating, Lynch, and Moulton that would redirect the money in NOAA's Asset Forfeiture Fund to pay for fisheries research, at-sea and shore side monitoring costs, and other priorities to "rebuild or maintain sustainable fisheries, ensure healthy ecosystems, and maintain fishing communities." Black sea bass are not legal to take at this time. I landed and put back six nice black sea bass in the 15 to 16 1/2 inch range when fishing for summer flounder off Newport this weekend. The sea bass were returned to the water as the season starts July 2 (one fish/angler/day) at 14 inches and then on September 1 it jumps to seven fish/angler/day. “Tautog fishing was good right to the end.” said John Wunner of John’s Bait & Tackle, North Kingstown. 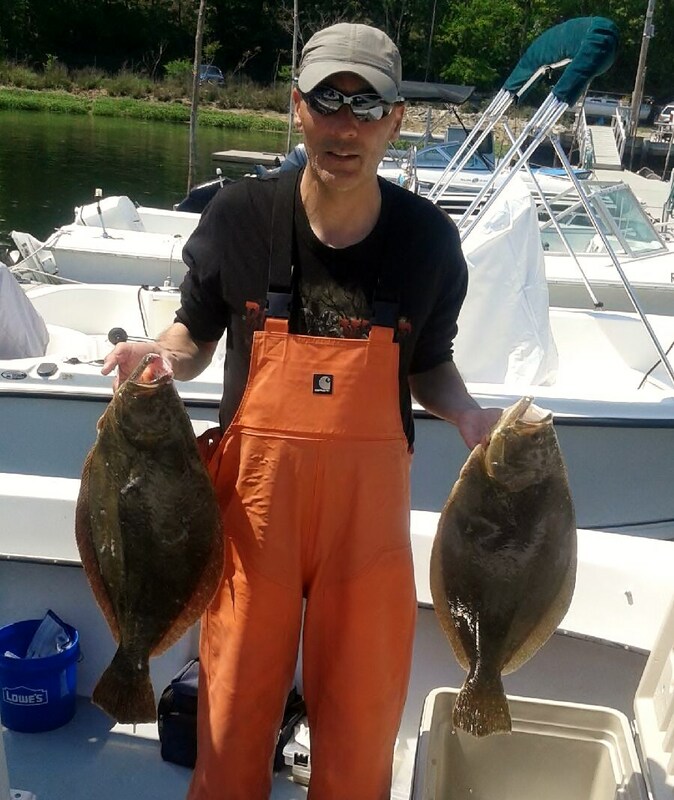 John said he weighed in a 11 ½ pound fish last week and the customer caught two additional nice fish. Tautog season ended May 31st and is now closed for the spawning season. It will open once again August 1. 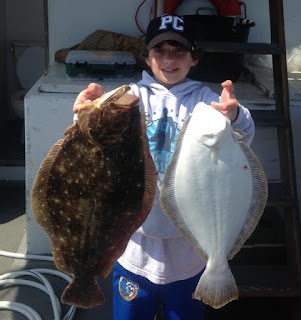 Anthony Mecurio Jr. from Coventry RI with a fine brace of fluke he buck tailed onto the deck of the Gail Frances party boat last week. 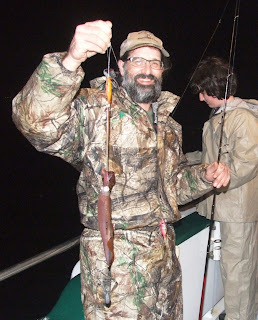 Michael Fotiades of Narragansett, RI with squid caught last week on a recent RISAA trip. His son George is in the background. A U.S. House of Representatives bill (H.R. 1335) titled "Strengthening Fishing Communities and Increasing Flexibility in Fisheries Management Act," that would reauthorize the Magnuson –Stevens Act is scheduled to come before the House next Monday. The Magnuson–Stevens Act (MSA) is the primary law governing recreational and commercial marine fisheries management in the United States. It was originally enacted as the Fishery Conservation and Management Act of 1976 and amended many times. The two recent amendments were the Sustainable Fisheries Act of 1996 and then the MSA of 2006. The supporters of this version or the reauthorization bill, which was authored by Alaska Congressman Don Young (R-AK), stated in a support letter that the bill will maintain the successful aspects of fisheries management under Magnuson-Stevens, while providing much-needed flexibility and economic relief to hard-working fishing communities. However, there are two sides to every story. Conservation minded fishermen and conservation groups throughout the country (including Pew Charitable Trusts and the Environmental Defense Fund) feel that this bill if passed will reverse much of the good that the MSA currently provides our fisheries. Last year US Senator Sheldon Whitehouse, D-RI and our congressional delegation, held an fisherman’s input session at the URI Bay Campus. At that meeting Rhode Island fishermen and Janet Coit, director of the RI Department of Environmental Management, testified in support of Magnuson-Stevens saying it has rebuilt many of our fish stocks and much of it should be left intact when it is reauthorized. Meeting attendees complemented the MSA for establishing Allowable Catch Limits (ACLs) that facilitated the rebuilding of fish stocks. NOAA's Office of National Marine Sanctuaries is seeking applicants with recreational fishing expertise to fill vacant seats on its advisory councils at Flower Garden Banks, Monitor and Stellwagen Bank national marine sanctuaries. It is vitally important that recreational anglers participate in sanctuary advisory panels as their point of view is not often heard due to a lack of participation. The recent New England Council vote on allowing recreational fishing in the Stellwagen Bank Sanctuary area was critical to recreational fishing and the charter fishing industry. It demonstrates the importance of angler participation on these sanctuary panels. A sanctuary advisory council is a community-based advisory group with representatives from various user groups, government agencies, and the public at large. The role of the council is to provide advice to the sanctuary superintendent on the designation and/or operation of a national marine sanctuary. Council members include fishers, divers, teachers, boaters, business people, activists, protected area managers, scientists, and elected officials. A successful candidate for the positions noted above will advise the sanctuary superintendent on the recreational fishing perspective. Nominations are due June 30. For information contact Russell Dunn, NOAA National Policy Advisor for Recreational Fisheries at Russell.Dunn@noaa.gov or 727.551.5740. “Cod fishing at the East Fishing grounds has been fair when anglers have been able to get there. 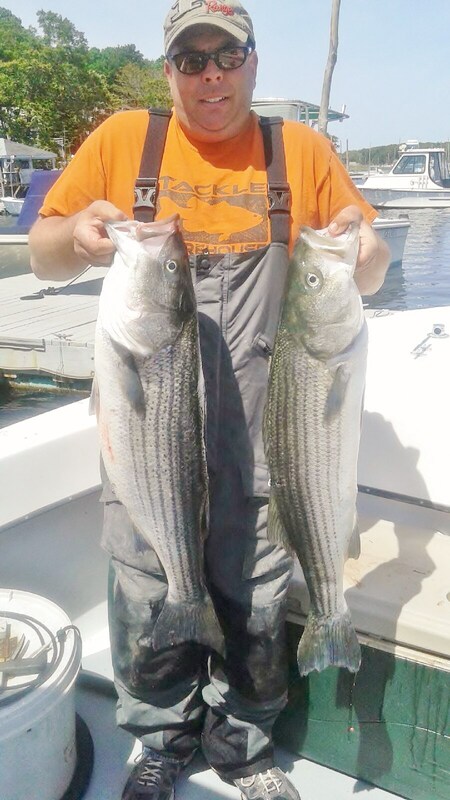 Anglers are catching shorts with keepers mixed in.” said Al Conti of Snug Harbor Marina, South Kingstown. Striped bass. “Keeper bass are being caught with tube and worm and with chunks of Atlantic menhaden in the East Passage near Bear Point, Prudence Island.” said Ken Ferrara of Ray’s Bait & Tackle, Warwick. 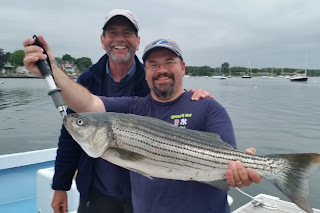 On RISAA‘s blog angler Bob Malouin said, “We motored over to Conimicut Light (Saturday). We didn't have any success throwing plugs and I was marking bass so around 0730 I decided to live line a pogy. In less than a minute I hooked into and ended up landing a 30 pound bass. After letting her go we ended up landing four more cookie cutter fish around 30". All fish were caught on live pogies directly south of Conimicut light.” “We weighed in a couple of nice fish, not particularly big but in the 33” to 34” range. Anglers are catching fish with top water lures such as SlugGo and Cohoes. Some anglers are live lining and chucking pogies.” said Manny Macedo of Lucky Bait & Tackle, Warren. “The worm hatch in Potter and Salt Ponds has been good with anglers landing bass there but things are pretty slow out in front.” Said Al Conti of Snug Harbor. No bass report from Block Island yet. Captains DeFusco and Sprengle of East Coast Charters with a Wahoo they caught last year in warm August water. Capt. Dave Monti with a school size striped bass caught Saturday in East Greenwich Cove. Gisele Golembeski with the 6.42 pound fluke she caught off Block Island this weekend. Visually Impaired Persons (VIP) will fish once again this year at the 8th Annual VIP Tournament being held on June 21. Call Ken Barthelemy at 401-828-0185. Capt. Brandon Lake uses the ‘jig and pop’ method at East Coast Charter to land tuna. Captains Jack Sprengle, Louis DeFusco and Brandon Lake are charter fishing rock stars and the ocean is their stage. The three captains run small and large center console fishing boats from their East Coast Charters headquarters in Warwick, RI. They fish a 21 foot center console on Narrgansett Bay for striped bass, fluke and tautog up to a 38’ Donzi center console with three Mercury outboards for high speed trips to fish warm water at the northeast Canyons for such species as Wahoo, Mahi Mahi, a variety of tuna, swordfish, sharks and more. They are a new breed of charter captain that are unconventional in their methods. 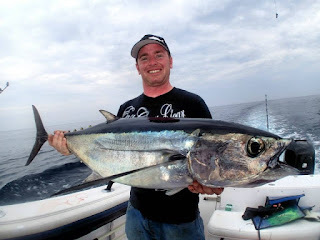 Their boats are fast, the action is fast and includes the exciting “jig and pop” approach (particularly for tuna) which places emphasis on the physicality and skill set of the individual angler as much as it does the efforts of captains and crew. East Coast Charters utilizes their private network of captains and fishermen, social media and satellite imaging services to plan trips and find fish for customers. Capt. 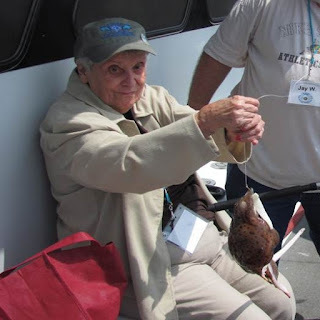 Lois DeFusco said, “If you are going for a 130 mile ride to find fish, you have to get it right.” East Coast Charters is all about using the latest tools and technology to find, hook and land fish. 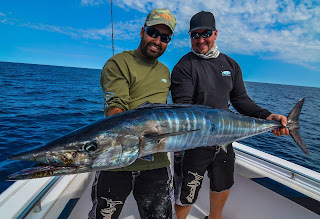 “Last year we did really well with Wahoo.” said Capt. Sprengle. 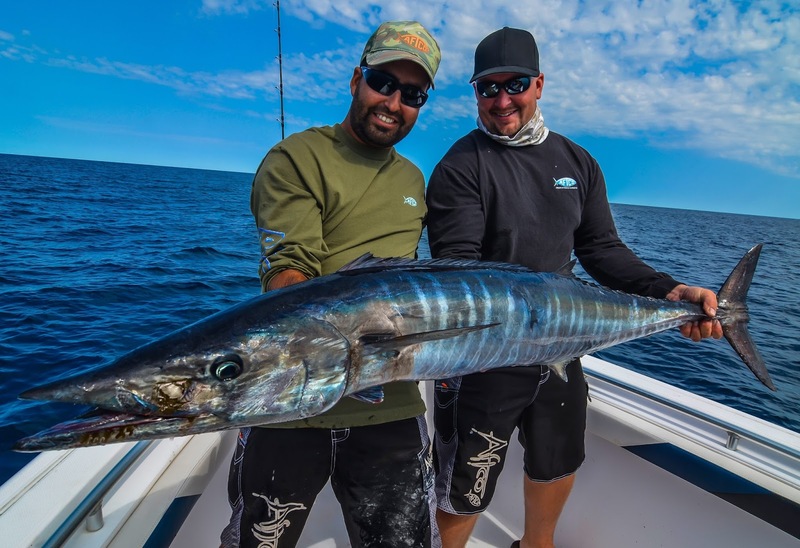 “We start looking for Wahoo usually around August when water temps reach 76 + degrees. We use chlorophyll charts to find the clearest water we can then search hard for floating debris. We will attach short sections of wire to our baits and troll at higher speeds up to nine knots for them but prefer jigging and casting to them when possible. When conditions permit we will even jump in and spear fish them.” said Sprengle. Visit www.eastcoastchartersri.com for more information about East Coast Charters. The Department of Environmental Management will hold a fly fishing seminar on Saturday, May 30 at Addieville East Farm, Mapleville, RI. The six- hour workshop will focus on equipment needs, fly tying, fly casting, basic entomology, and fishing in some of Rhode Island's premier fishing areas. Families with children 10 and older are welcome and all equipment is provided. Bring a lunch and have a great day of fishing. Space is limited and registration is required. Fee is $15.00/person. For more information and to register call 401-539-0019 or email kimberly.sullivan@dem.ri.gov. 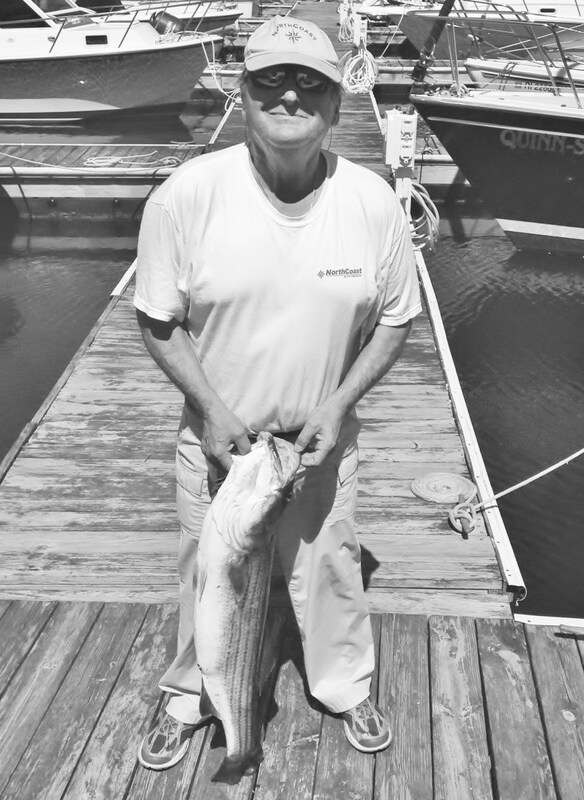 The RI Lions Sight Foundation (RILSF) will host their 8th Annual Fishing Tournament for Visually Impaired Persons (VIP’s) of Rhode Island on June 21, 2015. The Tournament which takes place on a Frances Fleet party fishing boat and is supported through donations from RI Lions Clubs, individual donors and one special corporate sponsor. For the second year in a row, the Tournament will receive support from the Pabst Brewing Company through the Pabst Blue Ribbon Northeastern Fishing Tournament held from June through September. VIP Tournament includes breakfast and a half-day of fluke fishing followed by lunch and an awards presentation. Participants vie for the opportunity to represent Rhode Island at the Lions National VIP Tourney being held in October in North Carolina. Tautog bite is fair with anglers catching fish with few reports of big fish. 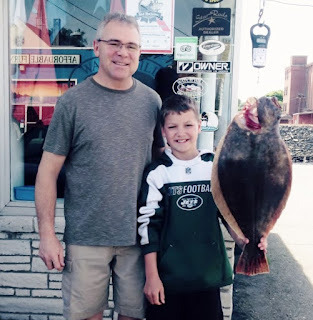 Noted local tautog expert Scott Kiefer of Coventry (he caught a 16 pound tautog in 2013) said, “Finally got the boat in and went out and was able to get a few short tautog. At least there was a bite, worms were the food of choice.” John Littlefield of Archie’s Bait & Tackle, Riverside said, “Two customers caught their limit of tautog (three fish/angler/day) at Conimicut Light this week. 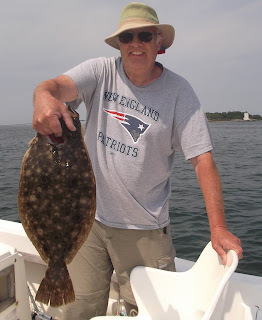 Some boats did well and others did not, it’s just a matter of position and being over the fish.” “Tautog fishing picked up this week with anglers landing keepers at Hope Island, the Spindle and Ohio Ledge.” said John Wunner of John’s Bait & Tackle, North Kingstown. “We have weighed in some nice fish to nine plus pounds last week but anglers are saying the bite is slow and sporadic… the fish are down there but they are just not very aggressive.” said Greg Bruning of the Tackle Box, Warwick.